Tattoo Ink - Where Does It All Go? Disclaimer:All images here are rough representations. Please read the text, not just the caption, for a full explanation. Also, the information presented here is in no way guaranteed to be complete, however I have tried to piece together as much of the puzzle as possible. Feel free to contact me if errors or omissions are found. - Then why does the tattoo fade over time? - What about the sun? These are some definitions that may be useful. Phagocytic - cells that are capable of phagocytosis; some cells can become phagocytic during an inflammatory response (e.g. keratinocytes), whereas others are phagocytic all the time (e.g. many immune cells). Dendritic Cell - an immune cell type that continually samples its environment for changes, and will migrate to lymph nodes to trigger an immune response if necessary. Mast Cell - an immune cell that plays a crucial role in allergic reactions and is present in connective tissue. Extracellular matrix - a generic name for the scaffold of proteins (both structural and "glue" types) that cells attach to and are supported by. Major components include basement membrane (one type of collagen network), elastic fibers, structural glycoproteins (e.g. fibronectin), proteoglycans("glue") and collagen. Fibrocyte - a cell type that makes up most of the cells in connective tissue. They secrete collagen as well as other proteins that make up the extracellular matrix when activated. They are not normally phagocytic, but become so when inflammation occurs. Fibroblast - a fibrocyte that is actively secreting proteins (an active fibrocyte). 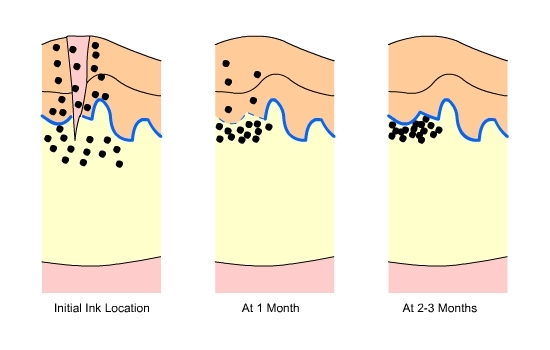 Granulation tissue - tissue that fills in gaps formed from debris or necrotic tissue removal. It consists of newly formed small blood vessels embedded in a loose structure of fibroblasts and immune cells. As the tissue matures, immune cells decrease in number, fibroblasts form collagen networks and blood flow resumes to the area. The skin is made up an outermost layer named the epidermis, followed by the dermis and the hypodermis. ·Epidermis: composed mostly of keratinocytes, cells that contain keratin, the protein that gives skin its toughness (not to be confused with collagen which gives skin its resiliency). ·Dermis: a network of elastic dense connective tissue containing collagen as well as sweat glands, hair follicles, sebaceous ("oil") glands, nerve endings and blood vessels. ·Hypodermis: loose connective tissue containing mostly adipose (fat) tissue. The epidermis is separated from the dermis by a basement membrane (an extracellular network of collagen fibers that serves as a support framework for cells) that strengthens the interface between the epidermis and dermis to prevent tearing from excessive stretching. Briefly, the stratum basale contains keratinocyte stem cells ("basal cells") that are continually dividing to create new cells. These cells differentiate, or in other words change, as they migrate through the layers to the surface. The stratum granulosum is the "waterproofing" layer of cells, and cells no longer divide at this level. The outermost surface layer is composed of dead keratinocytes which are essentially cells filled with keratin. The dermis, a connective tissue made up of collagen and networks of elastic fibers which give skin its resiliency, is the layer in which tattoo ink is deposited. The dermis (papillary layer) immediately below the epidermis is made of loose connective tissue and contains small blood vessels and nerve endings. 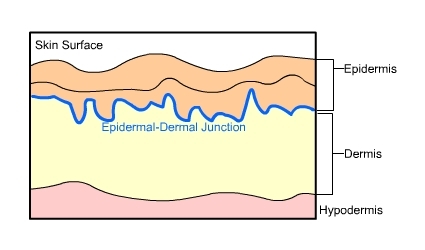 The rest of the dermis (reticular layer) is made of dense connective tissue and contains blood vessels, hair follicles, sweat glands, lymphatics, nerves, and sebaceous glands. The majority cell type in the dermis is fibrocyte (or fibroblast). These cells secrete the proteins that make up the connective tissue network. Other cells that are important in relation to tattoo ink are resident immune cells. These include dendritic cells, macrophages, and mast cells. The tattooing process causes damage to the epidermis, epidermal-dermal junction, and the papillary layer (topmost layer) of the dermis. These layers appear homogenized (or in other words, like mush) right after the tattooing process. The ink itself is initially dispersed as fine granules in the upper dermis, but aggregate into more concentrated areas at 7-13 days. Like any injury, the initial response is to stop bleeding, followed by tissue swelling, and the migration of non-resident immune cells into the area. The "automatic response" immune cells are mostly neutrophils, and macrophages later on. They are phagocytic cells that "swallow" debris to clean up the area and then leave via the lymphatics. This is the extent of an immune response unless an allergic reaction occurs or an infection sets in. The tissue is then repaired and/or regenerated by fibroblasts. Initially the tissue formed is known as granulation tissue (think fresh scar, pinkish and soft), which later matures into fibrous tissue (think old scar). Initially ink is taken up by keratinocytes, and phagocytic cells (including fibroblasts, macrophages and mast cells). At one month the basement membrane of the epidermis (epidermal-dermal junction) is reforming and the basal cells contain ink. In the dermis, ink containing phagocytic cells are concentrated along the epidermal-dermal junction below a layer of granulation tissue that is surrounded by collagen. Ink is still being eliminated through the epidermis with ink present in keratinocytes, macrophages and fibroblasts. At two to three months the basement membrane of the epidermis is fully reformed, preventing any further loss of ink through the epidermis. Ink is now present in dermal fibroblasts. Most of these ink containing fibroblasts are located beneath a layer of fibrous tissue which has replaced the granulation tissue. A network of connective tissue surrounds and effectively traps these fibroblasts. It is assumed that these fibroblasts are the cells that give tattoos their lifespan. 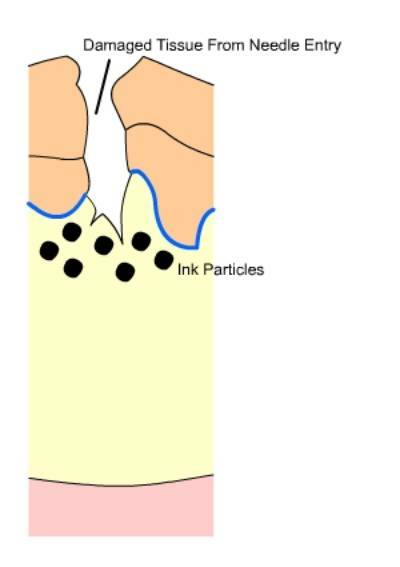 Fig.2 Injured Tissue: Ink is deposited into the upper surface of the dermis upon needle entry. Fig.3 Ink Location: soon after the tattoo is received, one month after, and two to three months after. Note the reformation of the epithelial-dermal junction over time and the concentration of ink just underneath it. Then why does the tattoo fade over time? It is debated whether all the ink particles are in fibroblasts, or if some remain as extracellular aggregations of ink. Also, the lifespan of the ink containing fibroblasts is not known. Presumably, ink particles are moved into the deeper dermis over time due to the action of mobile phagocytic cells (think immune cells), causing the tattoo to look bluish, faded and blurry. Examination of older tattoos (e.g. 40 years) show that the ink is in the deep dermis, and also found in local lymph nodes. Since some types of phagocytic immune cells migrate to lymph nodes to "present their goods", the discovery of ink in lymph nodes is consistent with the theory of phagocytic cells being the cause of ink movement. Sun exposure equals sun damage, whether you realize it or not. Langerhans cells, a type of dendritic cell, are present throughout the epidermis, but mostly located in the stratum spinosum. During sun exposure, many Langerhans cells will undergo apoptosis (a type of cell death where the cell breaks apart into many small fragments) while others migrate into the dermis and a minor inflammatory reaction occurs. The inflammatory reaction is not restricted to the epidermis, but also involves the dermis. Such a reaction causes the recruitment of more phagocytic immune cells to the area. With the presence of larger than normal amounts of migrating phagocytic cells, the chances of ink movement increases, thus accelerating the fading of the tattoo. other resources to educate yourself so you can make safe informed decisions.